The professional arborists at Sydney Tree Removals understand your concerns that you want to have your tree removed but have your plants and structures protected. When we carry out our professional tree services like palm removal in Mona Vale we make sure we do it carefully and professionally. We are more than tree loppers, although we specialise in tree removal, we operate as tree surgeons. Our work is done with precision and competence so you can be confident in the tree service provided. Originally tree lopping in the Northern Beaches meant cutting down the tree to ground level. Now days we refer to it as tree removal. If you want half a tree cut you can ask for tree topping, but the best course of action is usually to meet up for a free quote and discuss your tree removal options in plain English. We can remove any tree in Mona Vale using rigging methods, cherry pickers, boom lifts, and other arborist trade secrets. We know what to cut, where to cut, and how to cut it, so your tree can be remove efficiently, or pruned without leaving unsightly damage. 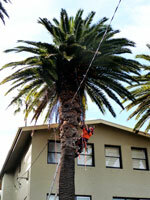 We offer more than tree removal in Mona Vale, we also offer a variety of palm and tree pruning. Some common tree pruning works include crown thinning, selective pruning, dead wooding, crown lifting, remedial pruning, formative pruning, palm pruning and clearance from transmission and power lines. 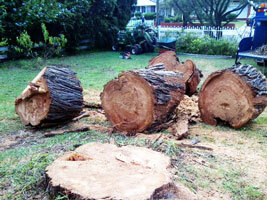 Once a tree has been lopped or removed in Mona Vale, there is still the issue with removing the tree stump. Our efficient stump grinding service is the easy way to remove the rest of the felled tree to allow you to plant, concrete, pave, or tile over the removed tree site. There is no better way to make your garden or property in Mona Vale drought tolerant and resistant to weeds than laying a layer of mulch on it. The mulch also provides nutrients to the plants as it breaks down while acting a blanket to prevent water evaporation. Our mulch is suitable for almost any garden or property. We can deliver mulch to Mona Vale or anywhere in the Northern Beaches for a fraction of the cost of buying it from a nursery.